The Hirschsprung Collection (Danish: Den Hirschsprungske Samling) is an art museum located on Stockholmsgade in Copenhagen, Denmark. It is located in a parkland setting in Østre Anlæg, near the Danish National Gallery, and houses a large collection of Danish art from the 19th and early 20th century. The emphasis is on the Danish Golden Age, from 1800 to 1850, but also the Skagen Painters and other representatives of the Modern Breakthrough are well represented. The museum is built around the personal art collection of Heinrich Hirschsprung, a tobacco manufacturer and patron of the arts who founded his art collection in 1865. Almost four decades later, in 1902, he donated it to the Danish state. It is displayed in a purpose-built Neoclassical museum building designed by Hermann Baagøe Storck and completed in 1911. Heinrich Hirschsprung was a tobacco manufacturer. 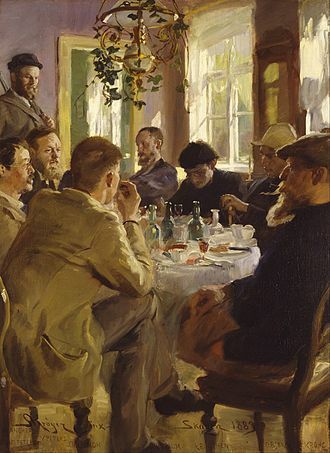 He was married to Pauline Hirschsprung, and the couple took a profound interest in the arts and counted many prominent artists of their day among their close friends, including the writer Holger Drachmann and the painter Peder Severin Krøyer, both associated with the Skagen colony. Over a period of four decades, beginning in 1866, Hirschsprung built an extensive collection of Danish art from the beginning of the 18th century and up to their own day. The collection was shown to the public for the first time in 1888 at Charlottenborg. This happened in connection with the Nordic exhibition of Industry, Agriculture, and Art which was expected to draw many foreign visitors to Copenhagen. The exhibition catalogue included 313 items, representing some 60 Danish artists. About half were paintings while the rest were drawings, watercolours, pastels and some sculptures. In 1900, Pauline and Heinrich Hirschsprung decided to donate their art collection to the Danish state. They had a deed of gift drawn up, which was deposited with the Danish Ministry of Cultural Affairs. However, the donation was not made public until two years later, in 1902, when the collection was once again exhibited at Charlottenborg. At the same event, the art historian Emil Hannover was put in charge of cataloging the collection. The exhibition at Charlottenborg also included renderings of the planned museum building, which had been designed by the architect Hermann Baagøe Storck. Disliking the Historicist style which dominated museum architecture in Copenhagen at the time, it was of critical importance to Hirschsprung that the collection be placed in an independent building built to a more "sober" design. He wanted the museum to stand on the ground left open by the now demolished ramparts around Copenhagen, where a number of new museum buildings, including the recently inaugurated National Gallery from 1899, had been constructed towards the turn of the century. Under the terms of the deed of gift, the Danish state and the City of Copenhagen, on their side, were required to make a site and a building available for its exhibition. This scheme was similar to the one which had been agreed upon in connection with Carl Jacobsen's foundation of the Ny Carlsberg Glyptotek. Still Hirschsprung's demand for an independent building gave rise to a political debate on arts politics which went on for several years and put the plans on hold. 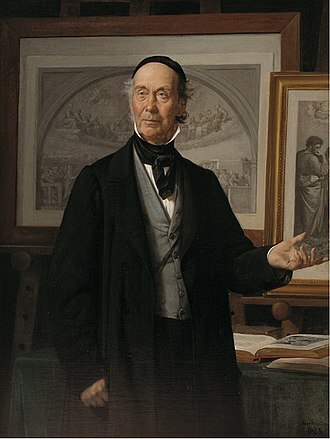 While discussions were going on, Hirschsprung continued to build the collection with acquisitions such as Joakim Skovgaard's cartoons for the decoration of Viborg Cathedral and a number of works by contemporary artists such as Michael and Anna Ancher and Vilhelm Hammershøi from the art collector Alfred Bramsen's Collection. A number of private individuals also promised to donate works to the collection once it passed into public ownership while others were purchased by Hirschsprung conditional on the same event. To make the collection into a representative display of 19th-century Danish art, Hirschsprung also started to add sculptures to his holdings, using the sculptor and family friend Ludvig Brandstrup as an adviser. In less than a year, Hirschsprung managed to collect the great majority of the 180 sculptures included in the 1902 catalogue. The collection represents 20 Danish sculptors. 1907 finally saw a successful conclusion to negotiations and a start could be made on building Storck's project from 1902. 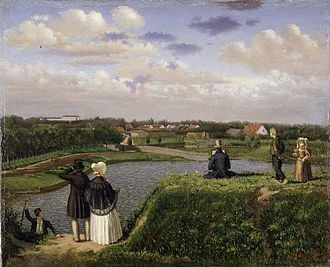 The site which was ultimately chosen was in Østre Anlæg, a park which had been laid out on the grounds of the city's former fortifications and where also the National Gallery had been built. Heinrich Hirschsprung died the following year, in 1908, and thus never saw his museum materialize. Emil Hannover, the art historian who had catalogued the collection, was charged with the interior design of the museum as well as curating the exhibition. He hung the paintings in chronological order, in the spirit of Hirschsprung. The Hirschsprung Collection opened to the public in 1911. Pauline Hirschsprung was present at the official opening on 8 July, but died the following year. The museum building is a simple neoclassical building with a light marble cladding and a facade with pediments and Doric pilasters. The floor plan consists of four large toplit galleries surrounded by smaller galleries, "alcoves", with light entering from windows set high in the walls. While the building from the outside has the appearance of a temple of art, the interior, with its small rooms, has the intimacy of a private home. The entrance hall to the museum has a floor mosaic from 1910 by Joakim Skovgaard in which stylised tobacco plants commemorate the founder of the museum. 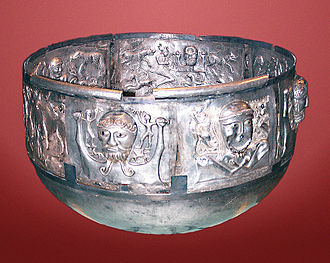 The museum exhibits more than 700 works of art. The emphasis is on the Golden Age of Danish Painting. 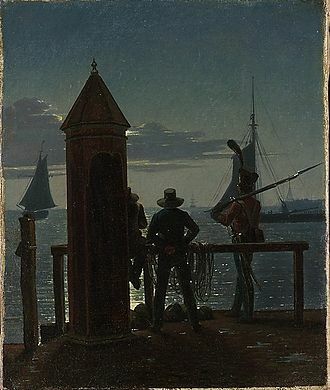 All the major painters of the period are represented, including C. W. Eckersberg, Christen Købke, Constantin Hansen, Wilhelm Marstrand and Martinus Rørbye, as well as many lesser known names. Fynboerne, natives of Funen, a group of artists from Funen who met at Kristian Zahrtmann's independent art school in the 1880s. The smaller galleries of the museum are furnished with furniture designed by the Golden Age artists and other provenance furniture associated with them. This was done at the initiative of Emil Hannover, the museum's first director, when he was put in charge of interior design prior to its opening. There is a rectangular, cobbled space in front of the museum. On its left hand side, stands Carl Johan Bonnesen's equestrian state A barbarian. A path to the right of the museum provides access to Ørsted Park close to the rear side of the National Gallery. ^ "Hirschsprung's Exhibition 1888". Den Hirschsprungske Samling. Archived from the original on 19 July 2011. Retrieved 28 August 2010. ^ "The Museum Building". Den Hirschsprungske Samling. Archived from the original on 23 January 2009. Retrieved 1 September 2009. ^ a b "While waiting". Den Hirschsprungske Samling. Archived from the original on 19 July 2011. Retrieved 28 August 2010. ^ a b "Building of the Museum Commences 1907". Den Hirschsprungske Samling. Archived from the original on 19 July 2011. Retrieved 28 August 2010. ^ "The Opening of the Museum 1911". Den Hirschsprungske Samling. Archived from the original on 19 July 2011. Retrieved 28 August 2010. Christoffer Wilhelm Eckersberg was a Danish painter. He was born in Blåkrog in the Duchy of Schleswig, to Henrik Vilhelm Eckersberg and carpenter and he went on to lay the foundation for the period of art known as the Golden Age of Danish Painting, and is referred to as the Father of Danish painting. In 1786 his family moved to Blans, a village near the picturesque Alssund, where he enjoyed drawing pictures of the surrounding countryside, after confirmation he began his training as a painter under church- and portrait painter, Jes Jessen of Aabenraa. He continued his training at 17 years of age under Josiah Jacob Jessen in Flensborg and he, had his sights set on being accepted at the Royal Danish Academy of Art in Copenhagen. Still under apprenticeship he produced proficient drawings and paintings, having amassed some money, including financial support from local well-wishers, he arrived at Copenhagens Tollbooth on 23 May 1803. He was accepted into the Academy without payment in 1803 where he studied with Nikolaj Abraham Abildgaard and he made good progress, painting historical paintings and landscapes. However, friction between him and Abildgaard impeded his advancement, and he did not win the Academys big gold medal until 1809 and he worked to earn living money as a hand laborer, and he made drawings for copperplate etchings. Although he received promise of a stipend in conjunction with the gold medal. On 1 July 1810, he married E. Christine Rebecca Hyssing against his wishes, in order to legitimize a son, Erling Carl Vilhelm Eckersberg and his son, eventually followed in his fathers footsteps with an Academy education, and a career as a copperplate engraver. On 3 July, a few days after the wedding, he began his travels out of the country, along with Tønnes Christian Bruun de Neergaard, enthusiastic art lover and financial supporter, he made his way over Germany to Paris. 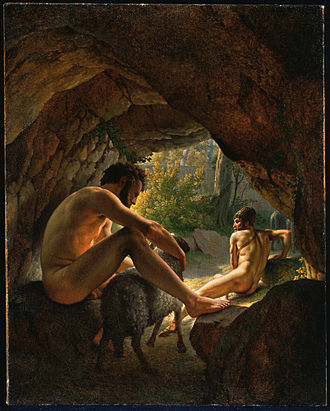 Here he studied under neoclassicist Jacques-Louis David from 1811-1812 and he improved his skills in painting the human form, and followed his teachers admonition to paint after Nature and the Antique in order to find Truth. Holger Henrik Herholdt Drachmann was a Danish poet and dramatist. He was a figure of the Modern Breakthrough, the son of a physician, A. G. Drachmann, whose father belonged to the German-speaking congregation at St. Peters Church, was born in Copenhagen. Drachmann first visited Skagen in 1872 with the Norwegian painter Frits Thaulow and he frequently returned, associating with the growing colony of artists known as the Skagen Painters although his painting took second place to his writing. In 1903, he and his third wife Soffi settled in Skagens Vesterby in their Villa Pax, in life, Drachmann returned to art, often painting pictures of ships and the sea. After his death, his Skagen home became a museum, Holger was sent to Bornholm to learn to paint, there he met his first wife Vilhelmine Erichsen, whom he married in 1871 in Gentofte. He was involved with a woman named Polly for a short while. Shortly after she gave birth to a daughter, she broke contact with him and he met with a young girl in Hamburg by the name of Emmy. They fell in love and got married and they adopted Pollys daughter and had four more children of their own. In 1887 she became ill, and one of their daughters died the same year. Perhaps suffering from stress, he fled into a relation with Amanda Nielsen, whom he called Edith and he would have many muses in his life, but on his deathbed he said that his two biggest muses were Vilhelmine and Edith. Behind in his studies, he did not enter university until 1865, from 1866 to 1870 he learned, under Professor Sørensen, to become a marine painter, with some success. In about 1870 he came under the influence of Georg Brandes, at various periods he travelled very extensively in England, France and Italy, and his literary career began by his sending letters about his journeys to the Danish newspapers. After returning home, he settled for some time on the island of Bornholm and he now issued his earliest volume of poems and joined the group of young Radical writers who followed Brandes. Drachmann was unsettled, and still doubted whether his strength lay in the pencil or in the pen. The Danish Golden Age covers a period of exceptional creative production in Denmark, especially during the first half of the 19th century. 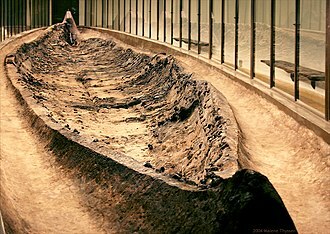 Although Copenhagen had suffered fires and national bankruptcy. It saw the development of Danish architecture in the Neoclassical style, Copenhagen, in particular, acquired a new look, with buildings designed by Christian Frederik Hansen and by Michael Gottlieb Bindesbøll. In relation to music, the Golden Age covers figures inspired by Danish romantic nationalism including J. P. E. Hartmann, Hans Christian Lumbye, Niels W. Gade, literature centred on Romantic thinking, introduced in 1802 by the Norwegian-German philosopher Henrik Steffens. Key contributors were Adam Oehlenschläger, Bernhard Severin Ingemann, N. F. S. Grundtvig and, last but not least, Hans Christian Andersen, Søren Kierkegaard furthered philosophy while Hans Christian Ørsted achieved fundamental progress in science. The Golden Age thus had an effect not only on life in Denmark but, with time. The origins of the Golden Age can be traced back to around the beginning of the 19th century, this was a very rough period for Denmark. Copenhagen, the centre of the intellectual life, first experienced huge fires in 1794 and 1795 which destroyed both Christiansborg Palace and large areas of the inner city. In 1801, as a result of the involvement in the League of Armed Neutrality. Then in 1813, as a result of the inability to support the costs of war. To make matters worse, Norway ceased to be part of the Danish realm when it was ceded to Sweden the following year, Copenhagens devastation nevertheless provided new opportunities. Architects and planners widened the streets, constructing beautifully designed Neoclassical buildings offering a brighter yet intimate look, at the time, with a population of only 100,000, the city was still quite small, built within the confines of the old ramparts. As a result, the figures of the day met frequently, sharing their ideas, bringing the arts. Henrik Steffens was perhaps the most effective proponent of the Romantic idea, in a series of lectures in Copenhagen, he successfully conveyed the ideas behind German romanticism to the Danes. The Doric order was one of the three orders of ancient Greek and Roman architecture, the other two canonical orders were the Ionic and the Corinthian. The Doric is most easily recognised by the simple circular capitals at the top of columns and it was the earliest and in its essence the simplest of the orders, though still with complex details in the entablature above. The Greek Doric column was fluted or smooth-surfaced, and had no base, the capital was a simple circular form, with some mouldings, under a square cushion that is very wide in early versions, but more restrained. 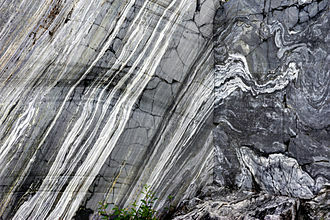 In stone they are purely ornamental, the relatively uncommon Roman and Renaissance Doric retained these, and often introduced thin layers of moulding or further ornament, as well as often using plain columns. The Doric order was used in Greek Revival architecture from the 18th century onwards, often earlier Greek versions were used, with wider columns. 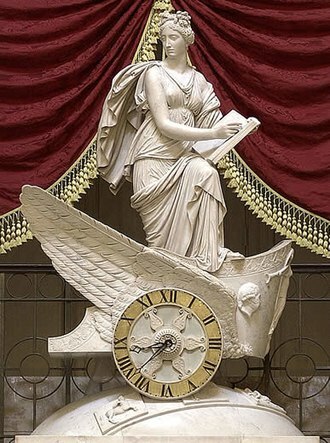 Since at least Vitruvius it has been customary for writers to associate the Doric with masculine virtues and it is normally the cheapest of the orders to use. In their original Greek version, Doric columns stood directly on the pavement of a temple without a base. The Parthenon has the Doric design columns and it was most popular in the Archaic Period in mainland Greece, and found in Magna Graecia, as in the three temples at Paestum. These are in the Archaic Doric, where the capitals spread wide from the column compared to Classical forms, pronounced features of both Greek and Roman versions of the Doric order are the alternating triglyphs and metopes. The triglyphs are decoratively grooved with two vertical grooves and represent the original wooden end-beams, which rest on the plain architrave that occupies the half of the entablature. Under each triglyph are peglike stagons or guttae that appear as if they were hammered in from below to stabilize the post-and-beam construction and they served to organize rainwater runoff from above. 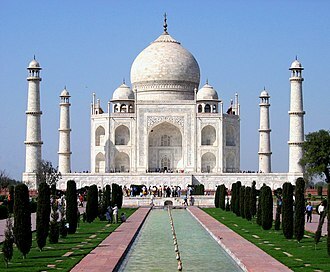 The spaces between the triglyphs are the metopes and they may be left plain, or they may be carved in low relief. Heinrich Hirschsprung was born on 7 February 1836 in Copenhagen into a family of German-Jewish descent. His father, Abraham Marcus, had born in Friedberg near Frankfurt am Main in 1783. Two years later, in 1827, he married Petrea Hirschsprung née Hertz and his brother Bernhard took over their fathers shop in 1858 and under their leadership the business, now specializing in cigar making, grew rapidly. In 1866, they bought a piece of unused land at Gammelholm, there they built a modern factory for manufacting cigars. It was designed by the young architect Ove Petersen in a Historicist style which relied on Italian Renaissance architecture for inspiration, Heinrich married Pauline Elisabeth Jacobson, afterwards known as Pauline Hirschsprung, on 26 June 1864. They had five children, Ivar, Åge, Pauline was the daughter of wholesaler Daniel Simon and Friederiche Jacobson née Gerhardt. They had their first apartment on Højbro Plads in Copenhagen and a house on Bredgade and they had country homes in the north of Sjælland as well as in Italy. Hirschsprungs disease is named after his pediatrician brother Harald, who first described it, Hirschsprung began his art collection in 1866, with the purchase of a painting by Julius Exner. His collection expanded over the years with additional purchases of paintings by contemporary Danish artists and it was a modern collection of examples from the Skagen Painters, the Fynboerne and Symbolists. Hirschsprung was a supporter, both personal and economic, of P. S. Krøyer who met him through Frants Henningsen, a friend at the Royal Danish Academy of Fine Arts. Hirschsprung admired Krøyer’s artistic talent and skills, and he purchased the first paintings from him in 1874 — four watercolors from Hornbæk, Hirschsprung helped finance Krøyer’s travels and foreign residence during the years 1877-1881, giving him the economic support needed to develop his artistic skills. 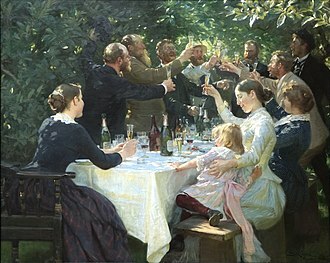 Krøyer was a friend of the entire family and he carried on a personal correspondence with Pauline and made a number of family portraits of Heinrich and their children. 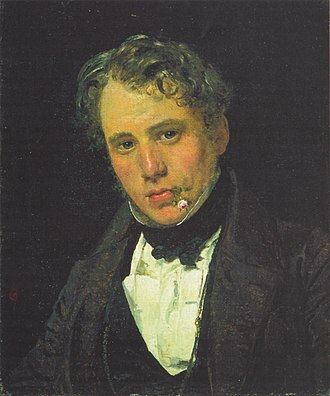 Wilhelm Ferdinand Bendz was a Danish painter mainly known for genre works and portraits which often portray his artist colleagues and their daily lives. He was one of the most talented artists in the generation of painters who studied under Christoffer Wilhelm Eckersberg. Wilhelm Bendz was born on 20 March 1804 in Odense on the island of Funen and he was sent to Copenhagen where he attended the Royal Danish Academy of Fine Arts from 1820 to 1825, where he studied under Christoffer Wilhelm Eckersberg. He may have acquired some knowledge of contemporary German painting, the Munich School, after his graduation from the Academy, Bendz contributed successfully with a number of works to the annual exhibitions at Charlottenborg in 1826,1827 and 1828. Another important work from this phase is A Tobacco Party from 1828, in late 1830 Bendz finally received a travel scholarship which enabled him to leave for southern Europe. After shorter visits to Dresden and Berlin, he went to Munich, which had developed into a vibrant centre for the arts. 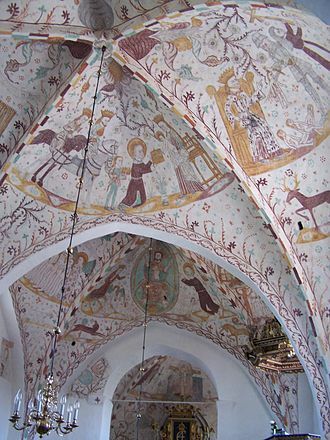 Interior of the current church. The 'old cathedral' in 1863. Left: Diagram of a light tube. 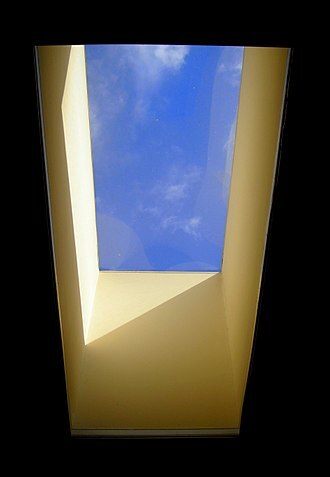 Right: Tubular daylighting devices harvest sunlight and transmit it through a highly reflective tube into an interior space at the ceiling level. View from the Artist's Window. 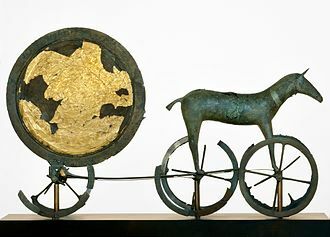 Dolun on Brandsø, The Hirschsprung Collection. 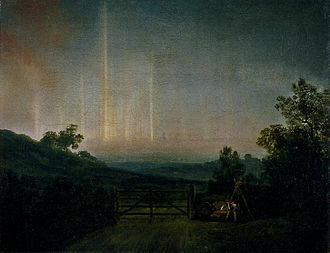 Heath landscape in Jutland, nascent storm, c. 1839. 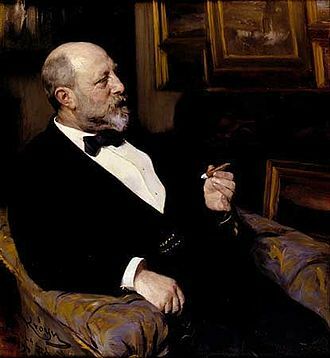 Drachmann painted by Peder Severin Krøyer.